Angie Roussin grew up in the lower mainland with the dream of one day, living with Orang-utans. That has yet to happen but in the meantime she took roughly a million art courses from the age of 8 to 23, and finally received a diploma in Graphic Design and Illustration from Capilano College in North Vancouver. Her first three years out of school were spent working as a graphic designer, production artist and art director in Vancouver - but that hectic life is now a thing of the past. In 2007 Angie gave up working in a cubicle and moved to Ucluelet to open a shop - the Piña Studio & Boutique. Here Angie spends her days designing t-shirts, making buttons and painting scenes of the beautiful Westcoast. All she needs now are a bunch of Orang-utans to move the the island... that may or may not happen. 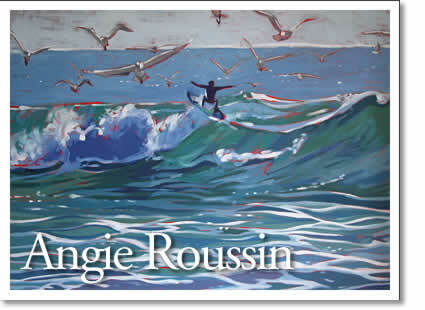 Tofino art: Angie Roussin creates her art in her studio/shop - the Pina Studio & Boutique in Ucluelet, BC.